I feel like this is going to be a quick post today because it’s nearly midnight and I have a busy day planned for tomorrow. Mondays, right? This Saturday was Mike’s birthday so I spent the weekend pampering the birthday boy and trying to make up for the fact that I was disgracefully late in ordering his birthday presents this year. So naturally I had to make him the most fantastically chocolate filled cake ever. With hazelnuts. And coffee. Chocolate + hazelnuts + coffee: the golden trifecta of goodness. Mike’s declared that this is officially his new favorite cake and is demanding that I share it on the blog (probably to get more cake!). That being said, expect that recipe sometime soon! Though to be honest I wouldn’t be opposed to eating soup all year long – and that was true even during the 112°F July summer days. I can’t resist a piping hot bowl of soup no matter what the weather. But I digress. 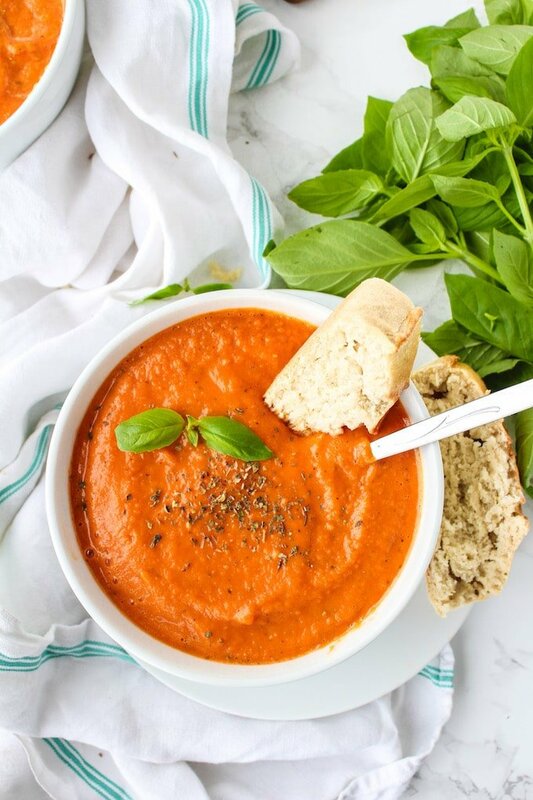 I don’t think I’ve ever met a soup I didn’t like, but I do have a special place in my heart for tomato soup. While I do love this particular soup for a lot of reasons, I mostly love how much flavor you get for such little effort. It’s mostly just a matter of chopping a few different vegetables to roast in the oven. After that it’s just a matter of blending and serving. Nothing fancy, nothing fussy. Just seasoned vegetables, pure and simple. And don’t forget the bread! Serve alongside your favorite crusty bread – I made a loaf of gluten free French bread to go along with this, but you could also try out my aquafaba French bread for an egg free version. 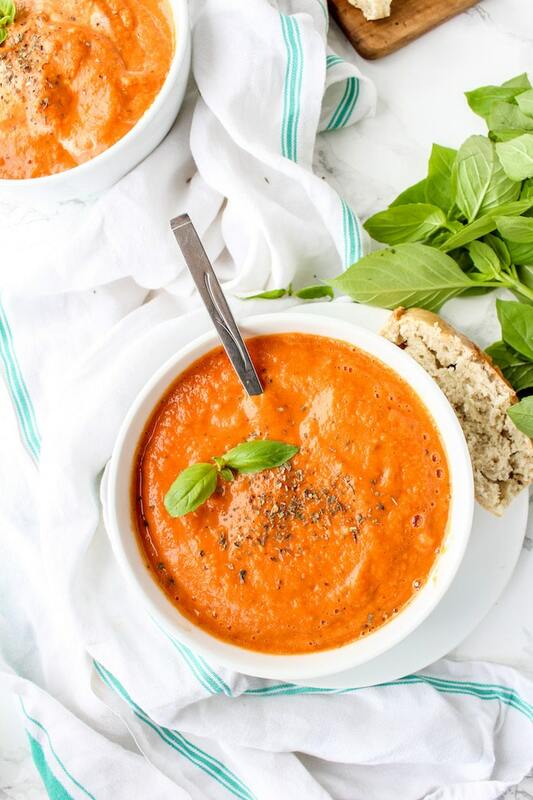 Don’t forget to #asaucykitchen on instagram if you try this roasted tomato soup! 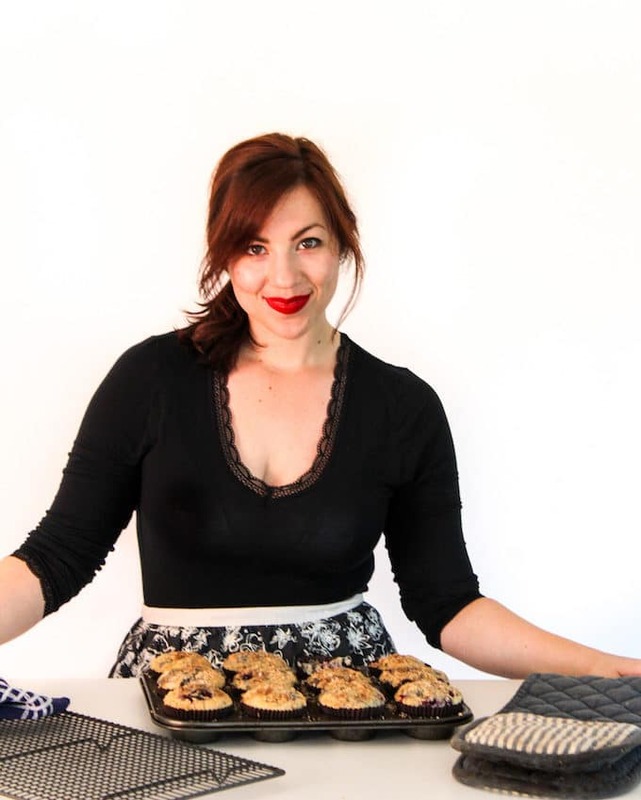 We love to see what you make with it! You can also post your pictures to my facebook page! Slice some fresh basil for topping and serve along side from French Bread and enjoy! I really love soup too. And I do eat it year round, although definitely more often in the fall and winter. 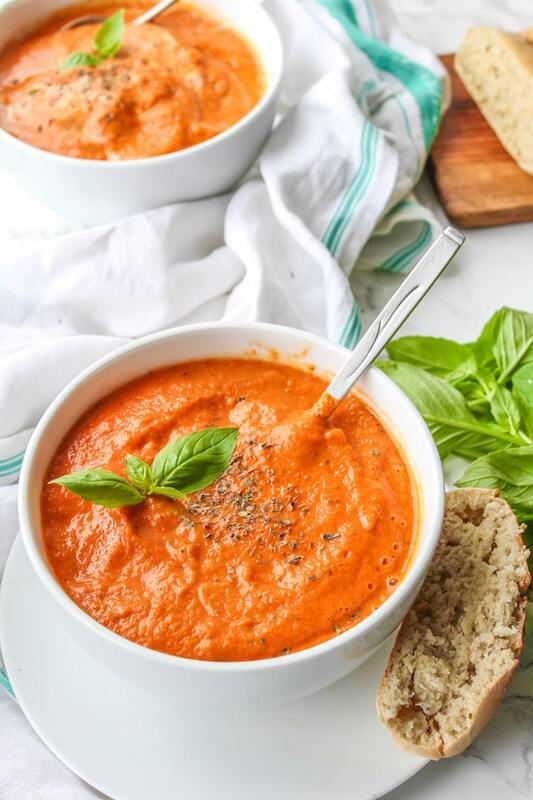 The roasted tomato soup looks perfect…and I have a bunch of tomatoes left over from the farmer’s market this weekend!